Sometime in december last year I ran accross the documented Life Project. I was immediately intrigued. 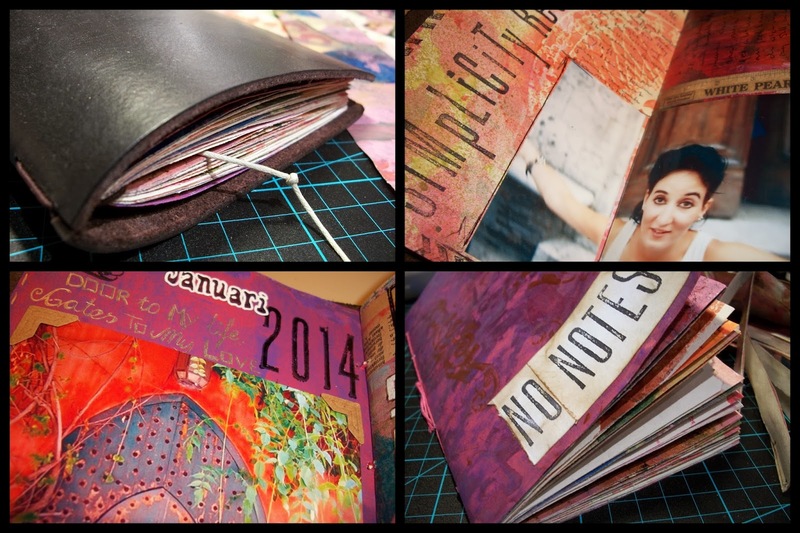 A combination of planner and art journal, executed any which way you would like. My favorite things combined. So I started looking into it and joined the facebook group, where lot's af people were already busy making the most fabulous planners and journals. Sharing all that they did generously. So I decided to join in the fun as soon as the two art journals were safely on their way. Last week I finally got those travelling again and I started thinking about how I wanted to participate in this project. I had a planner and that was working just fine for me. I did a video about that last monday. This is part one. I gathered the papers and cut them to a manageable size. And sewed them into a booklet. I'm really in love with this colourful booklet and think I'm going to enjoy every little bit of this project working in it. I had lots of leftover bits and pieces and saved those for collage work and things I might come up with. Here are a few of the pages inside the booklet. And as a happy coincidence, somewhere in the middle of my dropsheets I once stamped this sentiment "Art makes me happy" which is now a part of my booklet....and you know, it does make me happy! The last page and the Traveler's Notebook I use to keep all the bits and pieces for this project together. Before I started on the first weeks prompt for the Documented Life Project, I made some tiny notepads from the leftovers of the painted paper and some off-cuts from making inserts for the Traveler's Notebooks. Which I thought were so cute. The prompt for the first week was to make a photo or anything you would like of your front door. Interpreted any way you would like. So I took a photo of a door I once came across on the internet. Not my door, but a door I wish I had. A safe haven for all who enter. The second weeks challenge was a selfie and your word for the year, if you had one, and as fate would have it, just that week I got a question from and old friend for some photo's of a vacation in Italy and greece, a long time ago. Amongst these photo's was this picture of me. A picture of me during simpler times, when life was easy and the world was mine. Simplicity happened to be one of the two words I chose for this year, as I do need to work on that. This page is a great way for me to visualize that simplicity is an attitude! I journalled a little about me and who I think I am, added my second word, Resilience and felt it was done. I really like how it turned out. This project is going to be so much fun! I don't know if I will post every page every week, but we'll see. Part of my "Simplicity" approach also entails me not to be so fussy with my blog and just do what I like and not what I think is expected of me. It seems this approach has made me turn to my blog more often (amongst other things) and share what I like. So yeah, if you're not already, join the fun in the documented life project, it's not too late, you can hop in any time and maybe I'll see you there. Your notebooks are always a pleasure to look at, dear Monique! Enjoy this new group and please show us your results. So happy to have you joining us on this journey! Your journal is beautiful and love how you made it personal to you. Looking forward to seeing more of your work throughout the year. Years ago I also made a Travelers Notebook by myself. But its not so professional like yours.